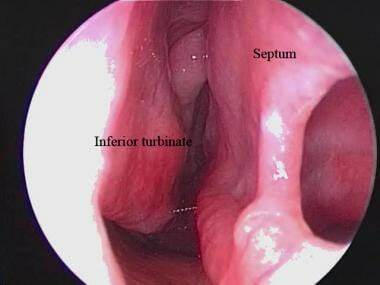 Endoscopic view of a septal perforation from the left nasal airway. 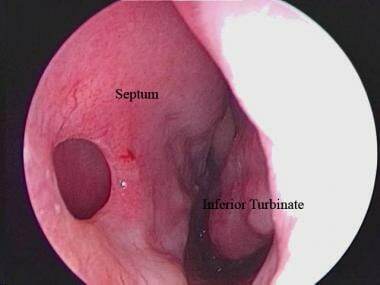 Endoscopic view of a septal perforation from the right nasal airway. Evidence suggests that systemic disease is more likely to result in a posterior perforation, whereas trauma, in particular nose-picking, is likely to result in an anterior perforation. Rarely, septal perforation can be the initial presenting symptom of natural killer/T-cell lymphoma, which stresses the need for biopsy of suspicious lesions or perforations. Nasal septal perforation prosthesis. Courtesy of InHealth Technologies (https://www.inhealth.com/category_s/162.htm). Septal buttons have been commonly used since the 1970s and may be placed in an office setting under local anesthesia or in the operation room. 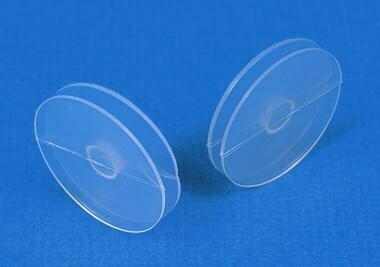 Buttons have been made from acrylic and plastic in the past but are now primarily made of soft silicone (Silastic; see image below). Prefabricated buttons are typically 1-piece units with a flexible hub and pliable discs, which allows them to adapt to the curvatures and irregularities of the septum. Two-piece units are increasingly available and tend to be easier to insert. Buttons may be placed as temporary or long-term treatment and do not preclude future surgical closure. Septal buttons are also an option for those in whom surgery may be contraindicated because of age, comorbidities, or underlying pathology. Imprecise fit of a nasal septal button may result in increased crusting, obstruction, foreign body sensation, and button dislodgement. Custom-fit button prostheses may provide more comfortable and more reliable fit. Other more recently described techniques for generating a custom-fit septal button prosthetics include a handled silicone septal button prosthesis fashioned using an alginate mould and plaster cast,  as well as a magnet-based 2-piece button prosthesis. Advantages of these buttons include patient comfort and ease of insertion and removal, including the ability for the patient to be able to do so on their own. The septum is a midline structure that divides the nose into 2 similar halves. The majority of the anterior septum is made up by the quadrangular cartilage. The posterior aspect of the septum is predominantly bony and includes the perpendicular plate of the ethmoid bone superiorly and the vomer inferiorly. The septum also receives bony contributions along its periphery from the maxillary, palatine, frontal, and nasal bones. Perforations, in particular those that are symptomatic, typically occur in the anterior half of the nose and correspond to the cartilaginous portion of the septum. The blood supply to the cartilage is dependent on flow from the nasal mucosa to the perichondrium, unlike bone, which has its own internal blood supply. This makes the anterior portion of the septum more susceptible to perforation secondary to mucosal insults than the posterior, bony portion. Mucosal injuries typically need to be opposing on both sides of a given segment of cartilage to fully degrade the blood supply and lead to necrosis and subsequent perforation. Along the lateral nasal wall lie three finger-like projections referred to as the superior, middle, and inferior turbinates. The turbinates are instrumental in humidifying air during nasal breathing. They are important surgically both as landmarks and targets for reduction to improve nasal airflow and reduce congestion. They border the superior, middle, and inferior meatuses, respectively. The superior meatus is the drainage area for the posterior ethmoid cells and the sphenoid sinus. The middle meatus provides drainage of anterior ethmoid and the maxillary and frontal sinuses. The inferior meatus provides drainage of the nasolacrimal duct. Septal deviations are relative contraindications to button placement, since they may cause poor fit against the septum. Absence of the nasal spine also makes for a difficult fit. Additional contraindications include patients with active infections of the nasal cavity, patients who actively use intranasal drugs, or patients who have perforations that are raw or actively bleeding. These patients require workup of an autoimmune, infectious, and malignant process. Anesthetize the nasal mucosa with 1% lidocaine and 1:1000 epinephrine solution on gauze or surgical patties. Alternatively, lidocaine, tetracaine, or cocaine sprays may be used, although cocaine has fallen out of favor because of adverse effects and required regulatory control (see Topical Anesthesia). Some patients, particularly those with very tender nasal passages, may require light sedation. For more information, see Nose Anesthesia. Patients should be sitting comfortably in the office chair if this procedure is being performed in an office setting. Described here are techniques for inserting a 1-piece, prefabricated, standard-size silastic nasal septal button. Measure the septal defect along with the upper and lower limit of the septum by inserting a piece of paper in one nostril and laying it long the septum. The size of the perforation can be marked from the other nostril using a marking pen. Trim the flanges of the button to lie equidistant between the perforation and the upper and lower limits of the septum. Smooth the edges of the flanges. See images below. 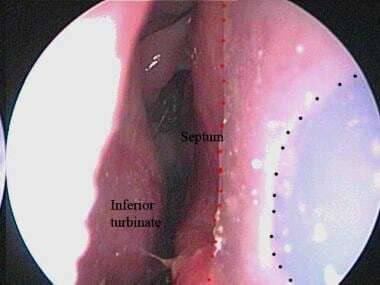 Endoscopic view of a nasal septal button from the right nasal airway. Black dots outline septal perforation. Red dots outline septal button. Endoscopic view of a nasal septal button from the left nasal airway. Black dots outline the septal perforation. Red dots outline the septal button. Use the purse-string technique on a 2-0 silk suture (Mersilk, Ethicon, Scotland) to collapse one disk of the silastic obturator 3 mm from the circumference of the disk, with approximately 8-mm spaces between each puncture site. Tie the suture, which results in the disk assuming a concertina shape. Loop the silk suture around the concertina and tie a second knot, which further collapses the disk. Grasp the undeformed disk of the silastic obturator with hemostat and introduce it into one naris with the knotted end of the silk suture placed anteriorly. Advance the collapsed disk through the septal perforation with fiber-optic headlight illumination. Once in situ, cut the silk suture with scissors and remove the suture. This results in the silastic disk returning to its original shape. If any further manipulation of the obturator is necessary, it can be carried out at this point. Make a slit in one of the flanges from the outer edge to the hub. Insert the septal button in one nostril with the slit side toward the septum. Deliver the tip of one of the slit edges through the perforation with a Jobson-Horne probe. Introduce the well-lubricated button into the narrower nasal passage until the anterior-most free margin of the disk, intended to be passed through the perforation, presents itself in the middle of the perforation. Grasp the free margin with a curved hemostat and pull it through the septum toward the contralateral, wider side. The patient should apply normal saline irrigation 3 times daily and nasal cream twice daily. Regular steam inhalations are recommended for 2 weeks. Scott-Brown WG. Kerr AG. Scott-Brown's Otolaryngology. 5th ed. London: Butterworth-Heinemann Ltd; Jan 1988. 154-79. Pallanch JF, Facer GW, Kern EB, Westwood WB. Prosthetic closure of nasal septal perforations. Otolaryngol Head Neck Surg. 1982 Jul-Aug. 90(4):448-52. [Medline]. Price DL, Sherris DA, Kern EB. Computed tomography for constructing custom nasal septal buttons. Arch Otolaryngol Head Neck Surg. 2003 Nov. 129(11):1236-9. [Medline]. Osma U, Cüreoglu S, Akbulut N, Meriç F, Topçu I. 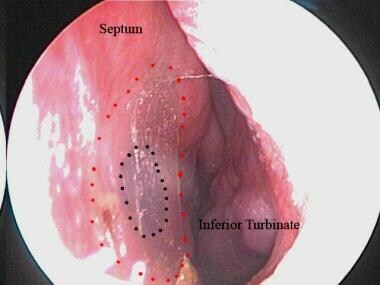 The results of septal button insertion in the management of nasal septal perforation. J Laryngol Otol. 1999 Sep. 113(9):823-4. [Medline]. Boynuegri S, Cayonu M, Tuna EU, Kurukahvecioglu S, Ozcan KM, Turkay B, et al. The Effect of Nasal Septal Perforation and its Treatment on Objective Sleep and Breathing Parameters. Med Sci Monit. 2016 Feb 15. 22:501-7. [Medline]. Chang DT, Irace AL, Kawai K, Rogers-Vizena CR, Nuss R, Adil EA. Nasal septal perforation in children: Presentation, etiology, and management. Int J Pediatr Otorhinolaryngol. 2017 Jan. 92:176-180. [Medline]. Lanier B, Kai G, Marple B, Wall GM. Pathophysiology and progression of nasal septal perforation. Ann Allergy Asthma Immunol. 2007 Dec. 99 (6):473-9; quiz 480-1, 521. [Medline]. Døsen LK, Haye R. Silicone button in nasal septal perforation. Long term observations. Rhinology. 2008 Dec. 46(4):324-7. [Medline]. Luff DA, Kam A, Bruce IA, Willatt DJ. Nasal septum buttons: symptom scores and satisfaction. J Laryngol Otol. 2002 Dec. 116(12):1001-4. [Medline]. Thomas L, Kalra G, Al-waa A, Karkanevatos A. Septal button insertion--the screw technique. Laryngoscope. 2010 Feb. 120(2):280-1. [Medline]. Eliachar I, Mastros NP. Improved nasal septal prosthetic button. Otolaryngol Head Neck Surg. 1995 Feb. 112(2):347-9. [Medline]. Taylor RJ, Sherris DA. Prosthetics for nasal perforations: a systematic review and meta-analysis. Otolaryngol Head Neck Surg. 2015 May. 152 (5):803-10. [Medline]. Barraclough JP, Ellis D, Proops DW. A new method of construction of obturators for nasal septal perforations and evidence of outcomes. Clin Otolaryngol. 2007 Feb. 32(1):51-4. [Medline]. Blind A, Hulterström A, Berggren D. Treatment of nasal septal perforations with a custom-made prosthesis. Eur Arch Otorhinolaryngol. 2009 Jan. 266(1):65-9. [Medline]. Teschner M, Willenborg K, Lenarz T. Preliminary results of the new individual made magnet-based nasal septal button. Eur Arch Otorhinolaryngol. 2012 Mar. 269(3):861-5. [Medline]. 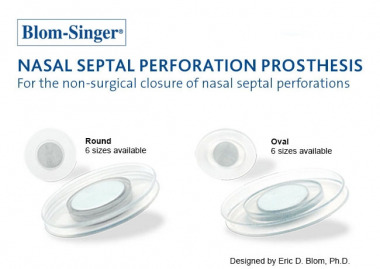 Zaoui K, Schneider MH, Neuner O, Federspil PA. [Prosthetic treatment of nasal septal perforations : Results with custom-made silicone buttons]. HNO. 2016 Dec. 64 (12):897-904. [Medline]. Kelly G, Lee P. A new technique for the insertion of a silastic button for septal perforations. Laryngoscope. 2001 Mar. 111(3):539-40. [Medline]. al-Khabori MJ. Simple method of insertion of Xomed one piece septal button. J Laryngol Otol. 1992 Apr. 106(4):358-60. [Medline]. Watson D, Barkdull G. Surgical management of the septal perforation. Otolaryngol Clin North Am. 2009 Jun. 42(3):483-93. [Medline].